In New York, data platform SimpleReach has raised $13.3m in a round of funding, and has named Hal Muchnick as CEO, replacing founder Edward Kim who will become Executive Chairman. 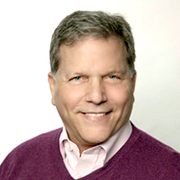 Healthguru Media founder Joshua Silberstein joins the company as President. SimpleReach brings together data from various sites into a single platform, allowing publishers to collect, verify and benchmark content and provide marketers with real-time insights. Muchnick (pictured) joined the firm last year as President, with more than 25 years' data, advertising, and marketing technology experience from senior roles at Experian, DoubleClick, Operative and Kontera. Prior to joining SimpleReach, he led the turnaround of audience data company AddThis, resulting in its sale to Oracle. Silberstein, who steps into Muchnick's shoes as President, has also worked as a venture capitalist and held senior operating roles in sales, finance, and operations. New funding has been led by Spring Mountain Capital, and brings the total raised to date to $24m. Kim comments: 'Hal has done an incredible job as President over the last seven months helping prepare for our future. Having him take on the role of CEO is a testament to what he's done and what I believe he will continue to do. Tried and true leadership will ensure we realize the value of the foundation that SimpleReach has built'.